The secret is in regulating the speed of runaway electrons. In light of the monumental crisis we’re facing, we’re referring to global warming and climate change, of course, we’ve never had to find a new source of energy as badly as we do right now. And it’s not just any alternative source of energy. What we need is a clean source, something that won’t contribute further to the degradation of our atmosphere. We already have solar power, wind power and hydroelectric power. But the kind of power that will top all those and which scientists have been aiming for so long to achieve has remained elusive so far. We’re talking about nuclear fusion — the same kind of power that fuels our Sun and all other stars. Nuclear fusion involves hydrogen atoms fusing together to form helium atoms and releasing a tremendous amount of energy in the process. But it’s far from being as simple as it sounds. To begin with, hydrogen atoms can’t be coaxed to bond unless there’s ultra-high pressure and temperatures of about 150 million degrees. Putting that figure in perspective — it’s hotter than temperatures in the Sun’s core. That in itself is difficult enough to achieve. But then there’s also the matter of runaway electrons behaving unpredictably, sometimes accelerating to the point of damaging reactors without any warning whatsoever. Based on research that recently got published in the journal Physical Review Letters, physicists from the Chalmers University of Technology may have figured out a way to bring us closer to realizing the dream of achieving nuclear fusion power. And it’s through those runaway electrons. The team’s take on the matter is this: if runaway electrons can be identified and decelerated, nuclear fusion can take place continuously, without the threat of destroying the reactor. Specifically, the tandem of doctoral students Linnea Hesslow and Ola Embréus, together with their advisor, Professor Tünde Fülöp, have been able to demonstrate that by applying some kind of ‘braking system’, it is possible to slow down the speed of runaway electrons. In their case, brakes will be applied by injecting pellets or gaseous forms of heavy ions like argon or neon. As the electrons collide with the heavy ions, there’s increased resistance and decrease in energy which tend to make the electrons slow down. With these many collisions, the speed of electrons become controllable, thus facilitating the nuclear fusion process, enabling it to continue without interruption. Hesslow isn’t even speaking metaphorically. The fuel needed to run a fusion reactor weighs less than a stamp does, and its raw materials literally come from ordinary seawater. 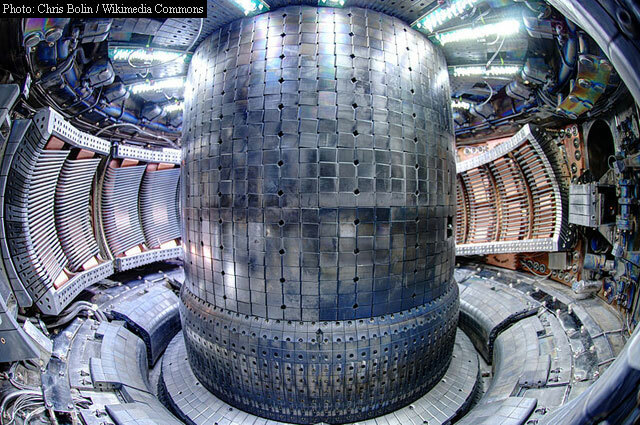 So far, the world’s best bet to achieve nuclear fusion is the ITER reactor in France. And while many believe the reactor will work, it has yet to overcome the challenge of producing more energy than it uses up.